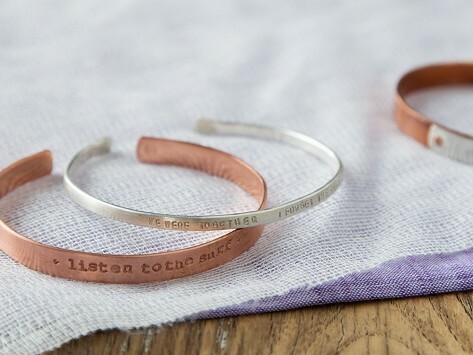 Engraved metal bracelets bearing timeless quotes serve as both beautiful jewelry and wearable, everyday inspiration. Each piece is hand made in Vermont with copper sourced from the U.S., and has a slightly rustic, natural-looking feel. Choose a quote to act as an inspiration, a reminder of love, or to make you smile. "We were together; I forget the rest"
"The stars in me are the stars in you"
"What if I fall? Oh but darling, what if you fly?" Dimensions: 2.5" x 2" x 0.25"
The bracelet is quite thin-easily bent. Leah Jones has always loved words and quotes—which served her well in the publishing industry. But she switched gears to start Alloy Jewelry, and now channels that love into engraved metal bracelets and jewelry. She hand crafts everything in her Vermont studio. Her bracelets bear timeless messages that many will find meaning in. She also personalizes cuffs with your chosen words, names, or initials and necklaces with your chosen initial, too. Because Leah hand makes each customized piece herself, it can take a few weeks—so plan ahead if you’re giving one as a gift. Their rustic, industrial look is even more special because all of Leah’s metals are sourced from the U.S. Her jewelry serves as a wearable reminder—Leah finds herself rubbing the words on her own throughout the day. Maybe you, or the special someone you give one to, will do the same.